No cake is more British than a frivolous Battenberg cake. At any afternoon tea, in fact at any occasion bring out a Battenberg cake and watch smiles all round. There is something cheering about the distinctive pink and yellow squares tightly wrapped in a thick layer of marzipan that no other cake seems able to achieve. Battenberg Cake is believed to have been named in honor of the marriage of Queen Victoria's granddaughter to Prince Louis of Battenberg in 1884. 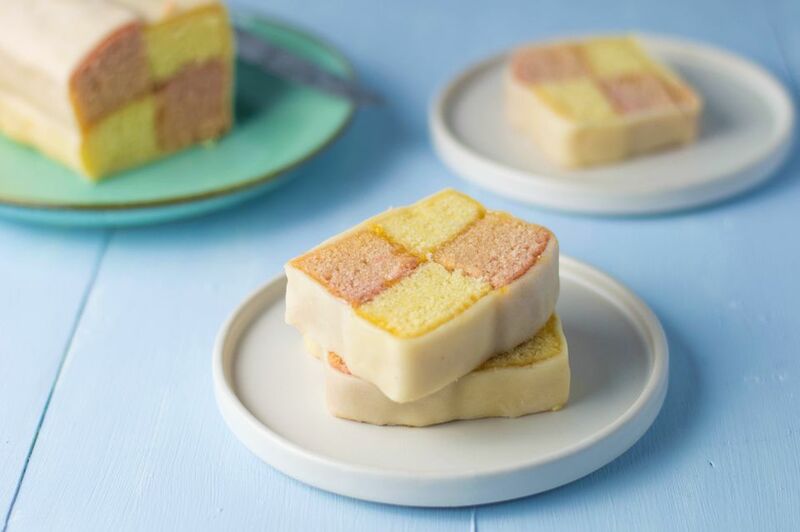 Though today many buy a Battenberg cake they are actually no more difficult to make than any other sponge cake as you can see in this recipe.It is such fun to make and even more fun to eat and cheers up any tea time table. In a large baking bowl beat together the butter and sugar until light and creamy. Slowly add the eggs, continuing to beat with the butter and sugar mix; resist the temptation to add the eggs too fast to avoid curdling the cake. Sieve the flour into the baking bowl and again, continue beating until smooth. Place half of the mixture in another bowl, add the food coloring a little at a time until you have a color you like. Stir well. Grease a 6-inch square cake tin and divide into two by placing a thick layer of aluminum foil down the center. Put the pink mixture into one side and the plain cake the other. Place in the oven for 25 to 30 minutes, or until the cake springs back when pressed lightly. Cut each cake to the same size, then cut each cake in half lengthways. Take a pink cake and brush one side with the warmed jam. Place a yellow piece next to it, jam side together and push gently together. Brush the top surface with jam and place a piece of yellow cake atop a pink piece and vice versa. Brush all the outside edges with more jam. Brush the rolled marzipan with a little jam and wrap it all around the cake, hiding the seam underneath. Trim away any excess.